Ani Archaeological Site - Stephen J. Kelley, Inc. The archaeological remains of the city of Ani is located on the Turkish side of the border with Armenia and was an important trading center along the Silk Road. In the 11th Century Ani grew in population and wealth. Both the Cathedral of Ani (1001) and the Cathedral of the Redeemer (1037) were constructed during this period. Afterwards it was occupied by the Persians, Seljuks, Georgians, and Turcoman. The Silk Road trade lost importance with the advent of when trans-oceanic trade. Total abandonment of the site was probably in the 18th century. Kelley serves on the Technical Control Team with the Turkish Ministry of Culture to conserve both Cathedrals. The agreed upon principles include appropriate diagnoses; use of multi-disciplinary teams; adopting measures of minimum intervention; employing local expertise and craft; and using traditional methods and materials where appropriate. The Cathedrals are constructed of rubble masonry faced on both sides with dressed tuff stone. The mortar is pozzolanic making the walls concrete-like which has allowed the Monuments to continue to stand through the harsh environment of eastern Anatolia. Work began on the Redeemer in 2009 with recordation using laser technology. The site was cleaned of debris from the 1930s collapse that had split the cylindrical volume in half. Fallen stones were catalogued, laid out on a grid for laser scanning and stored on site for possible reuse. Emergency stabilization procedures were implemented, and the monument is in constant long term movement, vibration and climatic monitoring. Repair of weaknesses in the Redeemer were begun in the summer of 2013 and seismic strengthening will be installed in 2014. 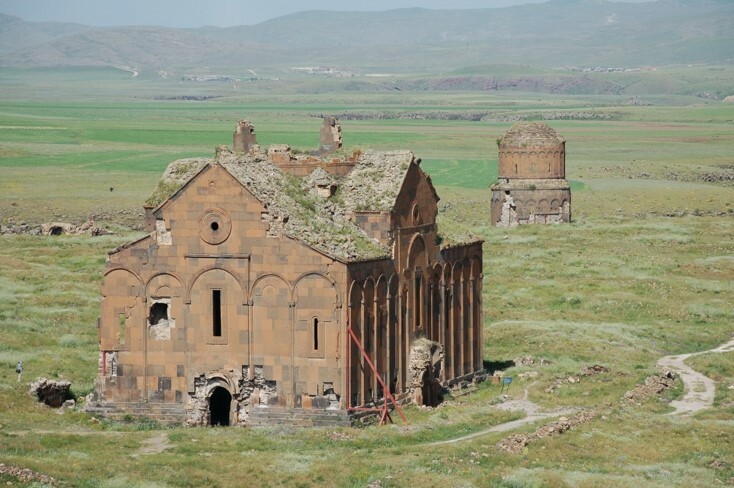 The Cathedral of Ani has also been laser recorded and excavations began in 2013. The team that we have assembled composed of Turks and Armenians has caught international attention for its potential to bring peace between these two peoples with a troubled and tragic past.